Puberty is generally taken as the onset of the first estrous cycle in the female and the production of viable sperm in the male. Sexual maturity is the age at first ovulation in the female and the presence of a dense mass of motile sperm in the male. In both sexes, there may be a difference of 2-4 years between puberty and sexual maturity among elephants. Although there is tremendous variation across elephant populations in the age of sexual maturity, the early East African studies showed that females and males within a population generally attain maturity around the same age. This seems broadly true across African and Asian elephant populations, with possibly the cows maturing 1 or 2 years prior to the bulls. For the purposes of demography, the age of first conception (and subsequent calving) in cows and the successful siring of a calf by a bull are the relevant variables. Cow elephants may conceive within their first few estrous cycles (each lasting 14-16 weeks), but successful mating by a bull may be postponed by as much as 10 years for sociological reasons. The difference between age at sexual maturity and age at first conception is not always explicitly stated in figures provided by some studies; the former can be computed only when a sample of culled elephants is available, while the latter is implicit in results from field observations. As the two figures are related and the difference between them is likely to be generally small for female elephants, I use these terms interchangeably. The age at sexual maturity and at first conception in female elephants seem related to local climate, forage resources, nutritional plane, and other ecological factors, such as density among wild populations. This varies both across regions and populations as well as within a population over time (table 7.1). Reproductive parameters of female elephants in various populations. *The Sri Lankan studies do not explicitly compute the mean age at I conception or mean calving interval; all studies assume that females are generally mature/ adult at about 9 years old, while the calving interval has to be deduced from population structure. Most studies of African savanna elephant populations report a mean age of sexual maturity of 11-14 years, although the range varies from about 9 to 22 years. Individual elephants, of course, may attain maturity earlier (8 years seems the lowest in the wild) or as late as 30 years. The typical population values come from studies at Lake Manyara and Hwange (both 11 years), Tsavo (11.7 years), Kruger (12 years), Mkomazi (12.2 years), Rwenzori (12.3 years), Gonarezhou (12-13 years), and Luangwa Valley (14 years). One of the lowest mean ages of sexual maturity seems to apply to the elephant population of Etosha in Namibia. Depending on the method of computing this figure, Malan Lindeque reported values of 9.1-13.5 years in 1983 and 10.7-11.9 years for the same population in 1985. The highest mean age of sexual maturity is 22.4 years, registered for the Budongo population by Richard Laws. Also notable is the change in the mean age of maturity for the Murchison (Kabalega) Falls elephants, from 16.3 years and 17.8 years for the northern and southern subpopulations, respectively, during 1966-1967 when Laws examined them, to 9.6 years and 9.0 years by 1974 when Rob Malpas investigated the same subpopulations. Female Asian elephants also seem to show wide variation across populations in the age of sexual maturity. Although the data are scanty, cows in Sri Lanka seem to have the lowest age at first conception. There are reports of cows mating as early as 7-9 years old; even if these are exceptional, a mean age of maturity of 10-12 years old is likely here. In southern India's Biligirirangans, I estimated the mean age of first calving in female elephants during 1981-1983 to be about 17-18 years; from this, it follows that the age of first conception would have been about 15-16 years. Later observations in the Nilgiris indicated a slightly lower age of first conception and calving. Khyne U Mar's detailed compilation of demographic records of several thousand timber camp elephants, both captive born and wild caught, in Myanmar shows that the cows have their first calf on average between 20 and 25 years, indicating that they first conceived between 18 and 23 years. These elephants are kept in forest areas under seminatural conditions and thus broadly reflect a relatively late age of sexual maturity even if these figures cannot be directly applied to wild populations. The gestation period in elephants is accepted to be generally between 18 and 23 months, with a mean of about 21 months. There are no objective data to determine differences, if any, between African and Asian elephants or between male and female calves, as claimed in some anecdotal accounts. After successful parturition, a cow elephant would be in lactational anestrus for about 2 years before she begins to cycle again. An interbirth interval of about 4 years is thus about the minimum expected in most cases. 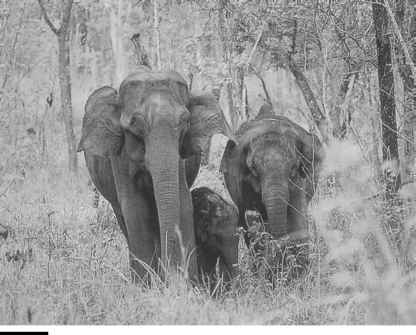 A well-identified adult female Asian elephant (note the deep tear in the left ear) with two of her offspring aged less than 1 year and about 5 years. 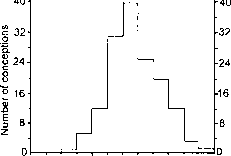 Intercalving interval in a population can be computed from a sample of such examples. indicate mean intercalving intervals of 4-5 years. In the Biligirirangans, I recorded a mean intercalving interval of 4.7 years during 1981-1983 and a slightly lower value in the Nilgiris during later, longer-term observations. Some African populations, such as in Luangwa Valley, Etosha, and Ka-sungu, have recorded even lower intercalving intervals of 3.8-3.9 years, presumably when they have been observed during an expanding phase. One of the longest mean intervals is 7.7 years for the population in the moist Budongo Forest. Intervals of 9.1 years and 5.6 years were reported for the northern and southern subpopulations, respectively, at Murchison (Kabalega) Falls during 1966-1967, which declined to 5.1 years and 3.5 years by 1974. The point to emphasize, therefore, is that calving interval may vary over time for a population or even over the life span of an individual and thus could potentially be a mechanism for regulating population growth. An interesting aspect of intercalving intervals has been pointed out by Phyllis Lee and Cynthia Moss from their long-term study at Amboseli. When a cow had a male calf, the interbirth interval for the next calf was 2-5 months longer on average than when she had a female calf because of the higher investment needed for nurturing a male calf (chapter 4). The age of reproductive senescence in female elephants would generally not be an important consideration in demography because the oldest individuals would only constitute a small fraction of the total adult females in a population. An exception to this would be a declining population with a preponderance of older individuals. Female elephants in the 56-60-year age class examined by Richard Laws and colleagues at Murchison (Kabalega) Falls showed them to be reproductively inactive; Laws and colleagues thus proposed that elephants might experience "menopause" similar to humans. Their observations were made for a very stressed population. Although an overall decline in fecundity can be expected in the older age classes in an elephant population, these individuals may also be reproductively active. Postmortem examination of culled elephants at Kruger and Etosha showed that most cows in the 50- to 60-year age class were reproductively active as they were pregnant or lactating. 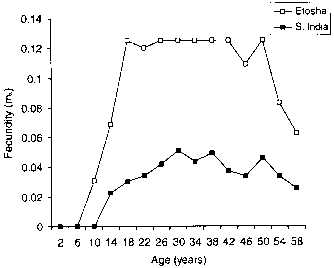 Captive elephants aged 50-55 years in southern India also gave birth as frequently as did the younger cows, although a decline in fecundity could be seen beyond this age (fig. 7.2). The highest age of calving among these elephants was by a cow (named Tara) when she was 62 years old (she lived to 75 years). Age-specific birth rates in elephants. Fecundity mx is expressed as the number of female offspring born each year to a female elephant of a particular age. The values shown are for a wild African elephant population culled at Etosha, Namibia, in 1985 (based on Lindeque 1988) and for captive Asian elephants in southern Indian timber camps (based on Sukumar et al. 1997 and newer analysis). Senescence should be indicated by a depletion of primary follicles or oocytes. John Hanks has suggested that reproductive senescence in elephants could result from disorders of the reproductive system as well as a reduction in oocyte number, but the evidence for the latter is weak. In the wild it would be rare for an elephant to survive beyond 60 years; for demographic purposes, it can be assumed that reproduction ceases at this age. (table 7.2). It is not clear if conceptions are influenced by climate or by seasonal work schedules of these "timber elephants." Large interannual fluctuations in births may also arise for several reasons. The elephants at Amboseli virtually stopped cycling during the long drought of 1976-1977, presumably when their fat reserves fell below a critical level. Over the next 2 years, practically every adult female in the population conceived, resulting in a baby boom during 1979-1980. An even more pronounced boom occurred over a 6-month period in 1983. Synchronized breeding by females in a population may thus result in large interannual fluctuations in births if more than an average proportion of cows conceive during an exceptionally good year. The long gestation period and lactational anestrus following parturition would ensure that a year of high conception/birth rate would be followed by at least 2 years of low conception/birth rates. Thus, Richard Laws interpreted a polymodal frequency distribution, with peaks and troughs, of the younger age classes in the North Bunyoro elephants as indicating such fluctuations in recruitment. This would be accentuated by low calf survival during a drought year. 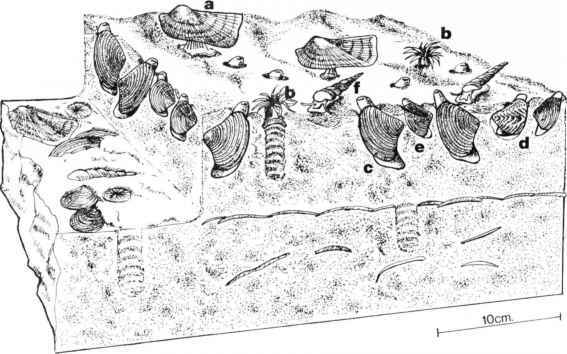 I also found evidence for cycles in recruitment, with a period of 3 years among 88 elephants, representing several family groups, captured in 1968 by kheddah at Kakankote in southern India. Malan Lindeque showed through modeling that, after two episodes of synchronized births, the age structure of the population deviates significantly from the starting age distribution. Seasonality in the birth of Asian elephant calves in captivity.